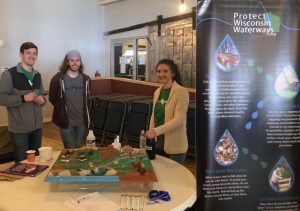 On March 9th, the Protect Wisconsin Waterways team had the opportunity to set up our enviroscape model at the Sustainable Janesville Living Fair. The PWW team was one of eleven groups giving presentations and demonstrations at the event. We were able to establish connections with people from the Ice Age Trail, Rock Trail Coalition, and an individual who was an expert on rain garden construction. Through these groups, we were given information about and invited to a few of upcoming events in the community. The team was also able to talk to several members of the community, a couple of families, and even a few individuals who were involved in the field. At the event, we used our enviroscape to show how certain pollutants get into our waterways, as well as what they could do to prevent some of that pollution. The team also gave out several promotional items as a way to get them to remember Protect Wisconsin Waterways. These items consisted of Protect Wisconsin Waterways swag like pencils, pens, wristbands, and stickers. We were also able to get a total of 7 pledges at the event.